The existing routes were developed to cover the whole Sinaia area, being concentrated in areas with high-demand of public transportation. At the moment, Sinaia has three bus routes operating 7-days a week, while the fourth route is activated on people’s request - usually on the most crowded periods of the year. All three routes have the starting bus station at Platoul Izvor, ending their routes at different bus stops. The duration of one complete ride is one hour. The T1 route starts at 06.00, ending at 21.00. It stops at the supermarket on the edge of the town between 09.00 – 16.00. From Furnica – the last bust stop – it leaves at 35 minutes past every hour. T2 route starts its program at 06.20. This route has the longest schedule, with the last run starting at 22.20. 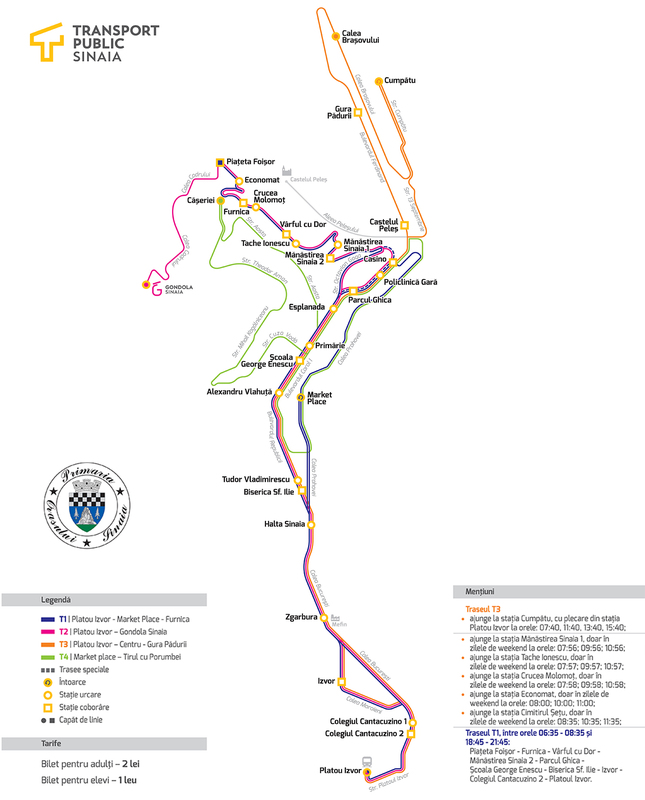 Between 09.00 to 17.00, the T2 route runs till the starting station of Sinaia Gondola, 1000-1400 section. At the 50th minute of each hour, T2 leaves from Sinaia Gondola to the town. Outside of the working hours of the Sinaia Gondola, T2 has its last bus stop at Piațeta Foișor. T3 has its first run at 06.40, with its last run being at 19.40. On demand of Sinaia’s residents, at 08.00, 12.00, 14.00 and 16.00, this route makes a detours and runs through the following bus stops: Cumpătu, Calea Brașovului, Gura Pădurii and Castelul Peleș. Also, during Saturdays and Sundays, this route has three runs at the Șețu Cemetery, These runs are the ones that leave Izvor Plateau at 7.40, 9.40 and 10.40.